Massive stars start their lives above a mass of ~8 time solar, finally exploding after a few million years as core-collapse or pair-production supernovae. Above ~15 solar masses, they also spend most of their lives driving especially strong, hot winds due to their extreme luminosities. All of these aspects dominate the ecology of the Universe, from element enrichment to stirring up and ionizing the interstellar medium. But when they occur in close pairs or groups separated by less than a parsec, the interaction of massive stars can lead to various exotic phenomena which would not be seen if there were no binaries. These depend on the actual separation, and going from wie to close including colliding winds (with non-thermal radio emission and Wolf-Rayet dust spirals), cluster dynamics, X-ray binaries, Roche-lobe overflow (with inverse mass-ratios and rapid spin up), collisions, merging, rejuventation and massive blue stragglers, black-hole formation, runaways and gamma-ray bursts. Also, one wonders whether the fact that a massive star is in a binary affects its parameters compared to its isolated equivalent. These proceedings deal with all of these phenomena, plus binary statistics and determination of general physical properties of massive stars, that would not be possible with their single cousins. The 77 articles published in these proceedings, all based on oral talks, vary from broad revies to the lates developments in the field. About a third of the time was spent in open discussion of all participants, both for ~5 minutes after each talk and 8 half-hour long general dialogues, all audio-recorded, transcribed and only moderately edited to yield a real flavour of the meeting. The candid information in these discussions is sometimes more revealing than the article(s) that preceded them and also provide entertaining reading. 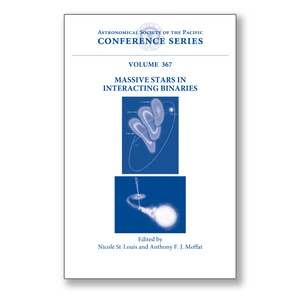 The book is suitable for researchers and graduate students interested in stellar astrophysics and in various physical processes involved when stars occur in bound pairs, groups or tight clusters.